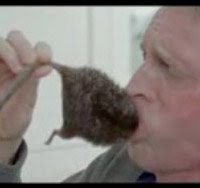 Pharma Marketing Blog: Was a Rat Harmed in the Filming of This Pfizer Commercial? Was a Rat Harmed in the Filming of This Pfizer Commercial? Pfizer wants people in the UK to know the dangers of purchasing fake medicines on illegal Web sites. So it created a video to depict that danger. The still image on the left is from a scene in that video, which is the centerpiece of the Web site www.realdanger.co.uk, aka, "The real danger of counterfeit medicines." In the video, a guy takes a couple of counterfeit pills from a plain, unbranded box and then regurgitates a dead rat! As Jim Edwards points out in his blog (here), the video "also raises an awkward question for Pfizer, where do its medicines come from? CEO Jeff Kindler told investors in October that he expected Pfizer to be “in” 137 cities in China by the end of 2008. It wasn’t clear whether those cities would contain factories, R&D sites or offices for sales rep managers." "The critical ingredients for most antibiotics are now made almost exclusively in China and India. The same is true for dozens of other crucial medicines, including the popular allergy medicine prednisone; metformin, for diabetes; and amlodipine, for high blood pressure. "Of the 1,154 pharmaceutical plants mentioned in generic drug applications to the Food and Drug Administration in 2007, only 13 percent were in the United States. Forty-three percent were in China, and 39 percent were in India." Meanwhile, Cleveland Clinic cardiologist Steven Nissen, who may be a contender for the job of new FDA Commish, warned in a letter to Nature that "Currently, about 1,600 facilities in China manufacture drugs or components of drugs marketed in the United States. Recent high-profile cases -- such as contaminated heparin -- poignantly illustrate the risks inherent in globalization" (see the entire letter here). The Pfizer UK Web site claims that "One in 10 UK men interviewed recently admitted to purchasing prescription-only medicines from unregulated sources, without a prescription. What they probably don’t know is that it’s estimated that between 50 and 90 per cent of medicines sold in this way have proven to be counterfeit which means they are taking a real gamble with their health." My guess, of course, is that Pfizer is concerned about counterfeit Viagra pills sold online (probably the most important "unregulated source"). Only men were interviewed about buying drugs online it seems. Any way, here's the video. You also can find it on YouTube by a search on "Rat Pfizer," which works much better than "Real Danger," which doesn't work at all! P.S. BTW, when I first saw the video -- before realizing the guy would vomit up a dead rat -- I was slightly turned off by the scene showing a close-up of the water faucet. The water seemed "off," not as pure as it should be. Unfortunately, after throwing up the rat, the guy takes a gulp of the water, which many flouride-in-drinking-water conspiracy buffs will tell you is contaminated with sodium flouride, aka RAT POISON! See "WHY DO THEY DUMP RAT POISON IN YOUR DRINKING WATER?" Just a little interesting aside. John - Pfizer’s ad campaign only makes sense if you also understand its UK distribution channel strategy. Otherwise, you will miss the as-yet-unstated goal of this campaign – eliminating the demand for parallel import product. See Pfizer Tries to Choke Demand for Parallel Imports.